The Tiny Miracle Nymph is a very simple fly consisting of a small bead, dyed peacock herl thorax, a body made of thread and a fine silver wire rib. 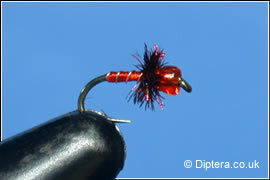 The fly can also be tied without the bead to allow the fly to sink at a slower rate. The fly is best used when small black insects are on the surface or when fish are taking from just under the surface but nothing hatching is visible. Fish using a floating line and long leader using anything from a dead drift or ultra slow figure of eight retrieve to a fast pull. This fly can be awesome in the right conditions.